The Seahawks traded down from the 18th to the 27th pick in the first round, then grabbed a potential every down back in San Diego State's Rashaad Penny. As expected, the Seahawks traded down in the first round of Thursday’s NFL draft, dealing their 18th overall pick and a seventh round pick to Green Bay in exchange for the Packers’ pick at No. 27, and third round and sixth round picks. With the 27th pick, the Seahawks opted to beef up the run game, drafting Rashaad Penny from San Diego State. Penny is the first running back the Seahawks had drafted in the first round since they took Shawn Alexander 19th overall in 2000. 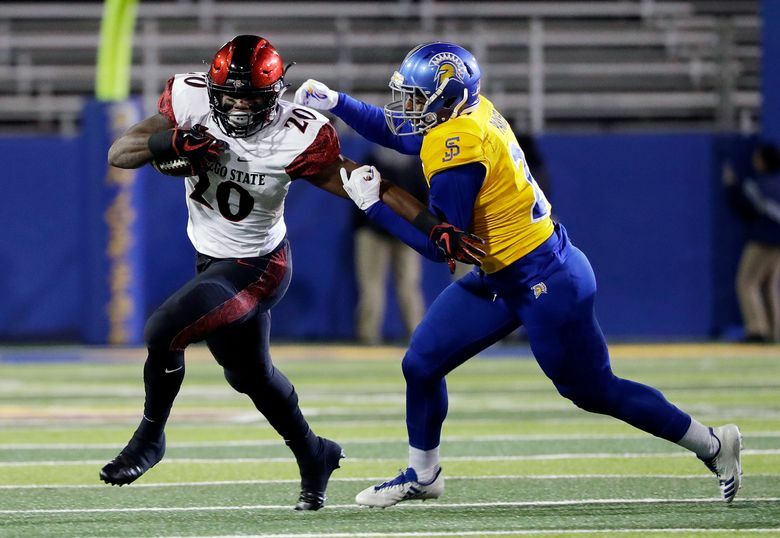 Penny was overshadowed by Donnel Pumphrey early in his career at San Diego State, but became the Aztecs starter and bell cow in SDSU’s run-heavy pro style offense after Pumphrey was drafted by the Eagles in 2017. Penny made his senior season count, finishing as the nation’s leading rusher, with 2,248 rushing yards and 23 touchdowns. He finished fifth in the Heisman Trophy voting this year, and was named a consensus first team All-American and All-Mountain West first team selection. Penny’s 2,248 rush yards and 2,974 all-purpose yards in 2017 are fifth in NCAA history. The Norwalk, Calif. native is also valuable on special teams. He was twice named Mountain West Special Teams player of the year and finished second in the FBS with three kick return touchdowns last season. Over his career, he tied the FBS record for kick return touchdowns with seven on kickoffs, and one on punt return. Penny has a physical running style and is built to take the pounding of an every down back. He’s elusive and tough to bring down, forcing 80 missed tackles in 2017 and gaining more than 1,200 yards after contact, per Pro Football Focus. Pass protection is his main weakness, which Penny admitted to on a conference call with reporters after he was drafted. According to Pro Football Focus, the running back gave up two sacks and seven hurries on 66 pass blocking snaps in 2017. Penny is the younger brother of Arizona Cardinals and former Idaho running back Elijhaa Penny. The two Penny brothers were primarily baseball players growing up and did not play organized football until high school. The younger Penny was a team captain for SDSU last season and is known as a hard worker, and an affable, low maintenance guy in the locker room.